But, inevitably, the Democratic debates have also featured extensive discussion on foreign policy, especially in the wake of the ISIS-inspired attacks in Paris and San Bernadino. Socialist Alternative has frequently pointed out that we have serious disagreements with Sanders on foreign policy, but the sharpening of the political debate makes it necessary for us to comment on this at greater length. However, in doing this it must also be acknowledged that, to date, most progressive workers and youth see not so much Sanders’ deficiencies in foreign policy as the contrast with Hillary Clinton’s record. As Sanders has frequently pointed out, Clinton enthusiastically supported the disastrous invasion of Iraq in 2003, whereas he didn’t. She was also one of the architects of the bombing campaign in Libya – which, as we warned, would inevitably lead to the country’s fragmentation and create an opening for right-wing Islamic forces, now including ISIS. Clinton is a warmonger who has, apparently, never met a military adventure she didn’t like. Progressive workers and youth – a large part of the Democratic Party’s base – understand that U.S. intervention in the Middle East has solved nothing for the people of the region and has not made ordinary Americans “safer.” They are opposed to endless war and, therefore, while Hillary believes foreign policy is her strong suit, her positions are not attractive to large parts of the party base. A genuinely socialist foreign policy must be an extension of a socialist domestic policy based on fighting for the needs of the working class. Capitalism has an insatiable drive to maximize profits. This results in exploitation of labor and extraction of raw materials at the cheapest possible price, caring nothing for the effects on the environment. This drive for profits extends beyond national borders and is played out on a world scale in competition and conflict between different capitalist powers. Under capitalism, so-called “national interests,” once you strip away the rhetoric, are really “national corporate interests.” This is demonstrated in so-called free-trade policies which are written behind closed doors by corporate lobbyists and “foreign aid” which is tied to goods from specific national corporations. 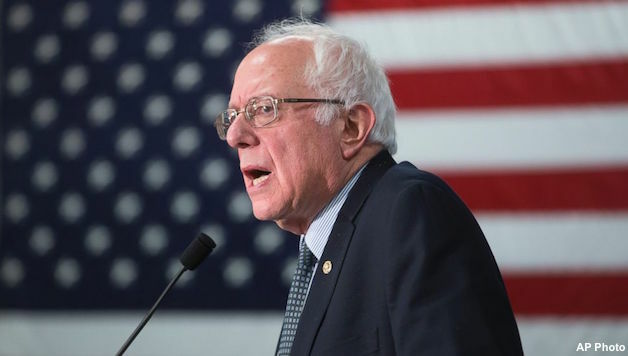 To Sanders’ credit, he strongly opposes corporate free-trade deals like the Trans-Pacific Partnership (TPP). But Sanders does not extend his opposition to anti-worker trade agreements to exposing the underlying corporate interests behind U.S. foreign policy. Instead, he focuses on opposing “unilateral” action by the U.S. and urges partnership with other capitalist powers. For example, he backed the U.S./U.N. invasion and occupation of Afghanistan in 2001, now in its 15th year with no end in sight. A socialist foreign policy should be based on clarifying the naked class interests behind U.S. foreign policy and supporting the struggles of working people internationally. As capitalism operates internationally, so will working-class struggles have to be international to be successful. Sanders is right to call the Syria conflict an “incredible quagmire.” Each major power, from Russia to Saudi Arabia, is pushing its own interests. U.S. foreign policy is based on maintaining its rapidly declining influence in the area and is in no way based on the interests of the Syrian people caught between the twin barbarisms of Assad’s regime and ISIS. Sanders, unfortunately, backs Obama’s bombing campaign while echoing a number of capitalist commentators who do not see the point of putting U.S. combat troops into Syria. Rather, he talks about “a battle for the soul of Islam” and developing a coalition of nations – including Saudi Arabia, Iran, and the Jordanian monarchy – to fight ISIS. “The working class and poor farmers of Iraq and Syria and the Kurdish people can only rely on their own self-organization to put an end to this nightmare. “United nonsectarian self-defense of threatened communities and minorities is vital and can be an important lever through which a grassroots movement fighting for socialist change can be rebuilt. Sanders’ mistaken foreign policy reveals his political limitations. Nevertheless, it does not negate the enormously progressive aspects of his campaign as it politicizes millions of workers and young people. But what is critical, as we have consistently pointed out, is to use this campaign to begin building a new political force, independent of all corporate interests, to represent the interests of the 99%. It will be an essential task for a new left party in this country to expose the corporate nature of U.S. foreign policy and adopt a clear policy of solidarity with the struggle of workers and the oppressed around the world. Next articleDefeat “Right to Work”!